Participate in building a collage of photographs from around the world demonstrating how ICTs are playing an enabling role in achieving the Sustainable Development Goals. Three winning entries will be awarded and presented at the WSIS Forum 2019. The selection of winners will be made by a selection committee determined by the Organizer, based on a number of substantial criteria (primarily based on the social impact potential). Decisions of the selection committee are final and without appeal. The three (3) winners of Contest to be determined by the selection committee will be announced at the WSIS Forum 2018 www.wsis.org/forum. The Organizer will notify the winners via email prior to the announcement and invite them to attend WSIS Forum 2019. Each of the three (3) winners will receive prizes: for the winning photo, and for the first two runner-up photos. The winners will receive the prizes during the WSIS Forum 2019 (8-12 April 2019). The three winning entries in the WSIS photo contest will be invited to participate in ITU’s #ICT4SDG campaign which highlights the many ways ICTs are contributing in addressing all the SDGs. A dedicated poster and other campaign materials highlighting their work will be created and shared within ITU and its stakeholders and the winner will have full use of all the material created. 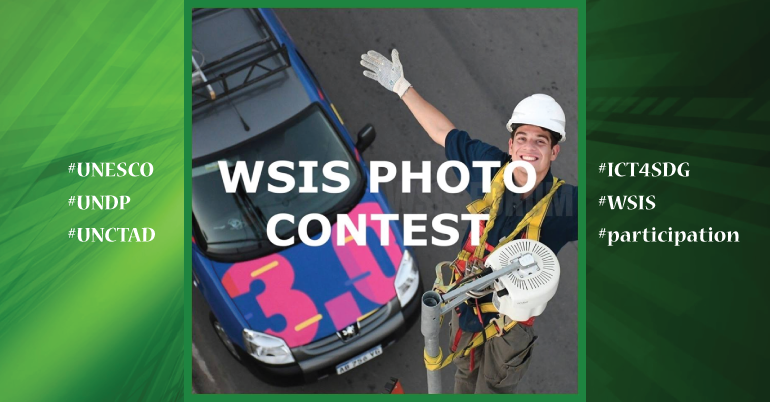 By entering the WSIS Photo Contest 2019 (the “Contest”), you hereby warrant that all information submitted by you is true, current and complete. The International Telecommunication Union (the “Organizer”) reserves the right to verify the eligibility of all participants. By entering the Contest, you accept the present terms and conditions (the “Terms and Conditions”). No purchase of payment of any kind is required to enter or win the Contest. The Contest will be administered by the Organizer through the WSIS Forum 2019 website www.wsis.org/forum; please follow the instructions under the WSIS Photo Contest 2019. The Contest is open to all WSIS stakeholders from governments, private sector, civil society, academia, technical community and international organizations. Individuals must be older than 18 years of age at the time of entry to be considered eligible to participate and win in the Contest. The Organizer does not provide the equipment or technical/communication infrastructure necessary to participate, create and submit an entry to the Contest. Applicants must not be employees (or members of an employee’s nuclear family or household) of ITU or holding an offer for future employment with ITU. All entries, regardless of categories, must not: (a) violate the intellectual property rights of third parties; (b) be illegal under applicable national laws and international law; and (c) depict or incite hatred, defame, abuse, harass, stalk, threaten a specific person or social group, incite violence or conflict or otherwise violate the legal rights of third parties (including those of privacy and publicity). Winners are invited to attend workshops during WSIS Forum 2019 and take part in activities organized within the programme at WSIS Forum 2019. A maximum of 5 entries may be submitted by a photographer. To enter the contest – all entries must include the official entry form available on the WSIS Forum website. Photos must be submitted with a title, date shot, location, and caption (maximum 100 words). Entries will only be accepted in digital format and must not be digitally enhanced or manipulated in any way. Image files should be 7 megabytes or smaller, must be in .jpg format, and must have a capture resolution of 1600×1200 pixels. Photos should neither violate the rights of a third party nor contain offensive content. Images must not be watermarked. Photos that have won awards in other photographic contests will not be considered. Photos that have been published earlier will not be considered. Photos must be sent by 23:59 Midnight (Europe Central Time) of 10 February 2019. The organizers have the right to exclude photos if they do not conform to the above conditions. The Contest shall consider only those submissions that fulfill the following requirements: Winners must hold a valid passport for the duration of the travel and will be requested to supply a copy of their passport for prize arrangements. The Organizer shall not be responsible for the travel and accommodation arrangements and costs, as well as daily subsistence allowance for the winners for the purpose of attending WSIS Forum 2019. Upon notification that a winner is invited to WSIS Forum 2019, acceptance must be confirmed within one week by the winner. If confirmation is not received within the aforementioned period, the Organizer reserves the right to withdraw its invitation, by notifying the winner accordingly.